P&G - the company behind many of Australia's favourite brands including Olay, Oral-B and SK-II – introduces Pantene Ice Shine, Pantene's new silicone*, dye and paraben-free collection that protects against damage to give you a healthy, natural looking shine with zero weight and zero residue. Designed to care for hair that feels weighed down, looks lifeless and lacks shine the Pantene Ice Shine collection works to smooth the hair's cuticle providing intensive nourishment and allowing hair to shine from within; Pantene Ice Shine shampoo - with no added silicone - cleanses oil and dirt residue gently, whilst the conditioner - with no added dye or paraben - leaves hair conditioned and rinses away quickly. Pantene ambassador and beauty expert, Zoe Foster, comments: 'I feel like this was made specifically for me (thanks guys, that was very thoughtful of you) because I have fine hair that is coloured, heat-styled daily, and heaving with product. The fact that Pantene Ice Shine removes most product build up as it cleans, protects my hair from damage, and is paraben, silicone* and dye free, means I get healthy looking, lightweight hair that isn't limp or flat in a day or two. It's pretty much a miracle, really." Pantene Expert Hairstylist, Barney Martin, comments: 'Fine hair can often look limp and lifeless, but the new Pantene Ice Shine combats this by providing protection against damage with virtually no weight. The formula provides finer hair with the perfect balance between delivering incredible shine to strands while remaining pure and free from silicones*, paraben and dye." Free from added silicone*, paraben and dye, the gentle Pantene Ice Shine formula cleanses fine hair to remove dirt and residue, leaving hair glowing. Transforming tired, dull locks into hair that is full of life and sparkle, Pantene Ice Shine Shampoo leaves hair feeling fresh and full of natural vitality. 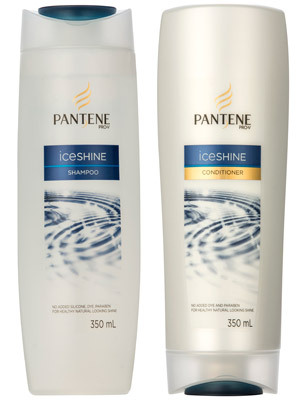 The Pantene Ice Shine Conditioner, free from added paraben and dye, leaves fine hair conditioned and radiant. By aligning hair fibers, Pantene Ice Shine Conditioner smooths the surface of the hair cuticle so each strand better reflects the light and is left radiant.